With over 120,000 patients in the United States waiting for a kidney transplant, it’s important to potential recipients to understand everything about the process and organ donation. Thoroughly understanding the process is one of the keys to a successful transplant and recovery. This pre-transplant guide will walk you patients through what to expect during this challenging time. 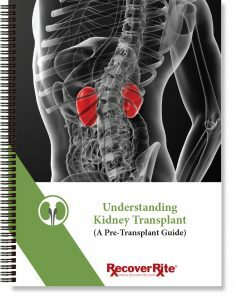 Having both pre and post-transplant educational materials will help your both your Transplant Team and your patients. These represent random sample pages. How Will I Get My Donor Kidney? What Will Happen When I am Accepted into a Kidney Transplant Program? What Makes You Entitled/When You Become Entitled/How Long Are You Entitled? Call 800-408-3464, or email info@recoverrite.com for additional details and pricing.